When a dog has breathing problems, it's up to the owner to seek help. Share these visitors' very different situations. I have a nearly three-year-old Cairn Terrier. He has always been very healthy, and the only trips we make to the vet are for regular vaccinations. I'm writing because he has started making a noise that sounds like hyperventilating. It's very random event where he'll make the noise for a few days, and then months go by before we hear it again. He just really sounds like he can't catch his breath. I was wondering what this noise could be. I've asked our vet about it, but he has no idea what I'm talking about and told me to bring him in when he does it again. The problem is, he only makes the noise on and off for about five minutes, and it would be impossible for me to determine when he's going to do it. Any ideas? In my own layman's opinion, I think the hyperventilating sounds may be part of a larger issue. I think we need to look beyond the breathless incidents and get a baseline evaluation of your dog's heart and lung health. The strange breathing sounds might be happening during short periods where your dog's heart beat is irregular. Since the heart also helps govern the amount of oxygen in the lungs, it would be best to see how healthy these organs are right now. This may actually reveal why your dog has intermittent breathing problems without waiting for your vet to hear the sounds to diagnose what's happening. There is also a chance that a structural weakness is causing the breathing tube to partially collapse when your dog's system is stressed. This is one more area your vet may want to look into. I'd make an appointment to have your vet at least listen to your dogs heart and lungs, and follow up with an x-ray if more information is needed. This might at least rule out a serious cause behind the breathing issues, and give you some peace of mind. It could also be helpful if your dog does have an undiagnosed congenital issue. Thank you for your question, and my best wishes for a happy outcome. I just did an Internet search and found a site called BuddyBeds.com that makes an anti-dust mite dog bed. The main body of the bed is made from memory foam, and the anti-dust mite cover is removable for washing. This might be what you're looking for. That said, you could also select any completely washable bed, cover it with an anti-dust mite cover and wash the entire ensemble once a week in very hot water. This should keep dust mites to the bare minimum and make your Shih Tzu far more comfortable. There is also one more product you might want to check out. It's called X-Mite. It's a powder that you use on furniture and carpeting to kill dust mites. Since your dog will likely encounter mites in these areas as well as her own bed, you might find it useful. Just be sure to use it exactly according to the directions. Thanks for your question, and I hope you find these suggestions helpful. I have a question about a Schnoodle puppy we are in the process of adopting. He is eight weeks old and seems to be a very healthy weight. The past two times we've seen him, he seems a little lethargic, and most recently we noticed that his nose and eyes were running. I know that several of his kennel mates have been treated with antibiotics recently for "colds" and kennel cough symptoms. We were told that he was going to be put on an antibiotic starting today. Should we be concerned? He seems very sweet otherwise. He comes to us and wants to be picked up. The only thing we have noticed is that we have never heard him bark, only whimper. We don't want to get attached to a dog who is seriously ill. What is your advice? It does indeed sound like the rescue shelter is experiencing an epidemic of Kennel Cough right now. This isn't unusual for this type of facility because the kennel cough virus is highly contagious. The antibiotics are really only useful to treat secondary bacterial infections that have an opportunity to take hold and make the symptoms worse while the puppy's immune system is busy fighting off the virus. The lack of barking may due to the fact that your prospective pup's throat may not feel very good right now. If you are truly concerned, you can tell the shelter that you want to wait until the pup is well before you bring him home, and they should be understanding of that fact. His lethargy may be a sign that his kennel cough is developing into pneumonia. If you want to give this puppy the best chance to recover and you don't have any other pets in the house, you could bring him home and finish nursing him yourself. 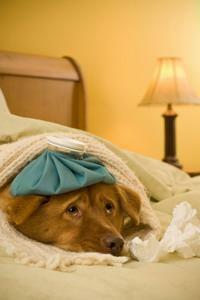 You'll find suggestions about how to do this in our article Home Treatment for Kennel Cough. However, I can't predict the outcome of this illness. It depends on just how deep the infection has reached into the lungs. All of this said, I do not blame you if you decide to wait. The puppy is currently receiving veterinary attention where he is now, and he really should recover with proper care. Once he's well, you should have no worries about bringing him home.